Though quantity of the votes may have been counted the quality of the two contesting groups needs to be measured. For most of the two years of the campaign, the polls only marginally altered. The No Campaign Better Together was mainly a media campaign that ran adverts, appeared on billboards and sent out mail drops. Unlike the Yes campaigners who were active for the two years and could be seen on the streets, held meetings and delivered their own leaflets. Tory money funding a campaign of the three main Westminster parties was a very unappealing sight. Eventually as the polls began to move, the challenge became clearer, so the Labour Party began to organise its own “I’m voting No” campaign. Better Together was only a figleaf for the real challenge. Yes campaigns were in direct challenge to Labour Party. Using the authority of the Labour Party to confront the Yes Campaign has catastrophically backfired as they are now seen as opposing all worthwhile change in collusion with the Coalition parties. The inconsistencies of the Yes campaign on currency, continuation of the monarchy, NATO membership and much else evaporated. Large numbers across Scotland did not just answer the question on the ballot paper “Should Scotland be an independent country?” But have begun to ask the more important one, “What kind of country do I want?” The result showed a lot more people want fundamental change. It may have been undefined but it was real nonetheless. This process won’t stop after the polls have closed. This is why the vote should not be understood as for or against national independence. Limited constitutional change, even token national independence may not be enough. Only a national independence that expresses anger at ongoing economic injustices, Westminster privileges, uncontrollable militarisation, and much else was exposed. Labour campaign boss Douglas Alexander laughingly misunderstood the massive mood for change alleging “there was a shift below the level of logic.” Large numbers could not understand how the Labour Party could claim the benefits for a successful economy and society that was failing them. During the second debate, Alistair Darling’s failure to propose any meaningful job creations projects or condemn the savage welfare reforms convinced many that the troika had no desire for any meaningful change. The main losers from the Referendum campaign were the three main UK parties whose indifference stirred only when their own self-interest was threatened. They were increasingly seen as having too much that united them. Apart from failing to express the aspirations of around half the population, the corporate media failed to notice what was happening on the ground revealing an unwillingness to report it. And the broadcast media that displayed its unconscious biases so often alienated large numbers. Is it surprising alternatives from the public meeting to the social media flashmob became a substitute? The reactionary mobilisation that took place in the campaign’s final weeks was a lesson in how real power works. This was what happens when a third of the landmass, almost all of the oil and gas revenues, the only viable deep sea bases for nuclear submarines might disappear. Business leaders threatened to disinvest, push up prices or create economic instability joining with military securocrats offering nightmares of the violent future, as well as of rejected politicians lumbering from their long sulk to propose nickel-and-dime reforms. Workers received letters from their bosses that their jobs would go if they voted Yes and pensioners terrified they would lose their incomes. It will be more vicious next time. Some may have proudly voted to stay in the Union, but large numbers were terrified into voting same way as the comfortable and the contented. This is why the voting results took on the features of a class struggle. The United Kingdom state is now un-reformable. Existing devolution let alone further proposals have already challenged the so-called constitutional structures of Crown-in-Parliament aka parliamentary sovereignty. This has stopped all pressures for a popularly based sovereignty for hundreds of years. The promise that Westminster will recognise Holyrood as “permanent” is impossible because no parliament can ever bind a subsequent one. All power must lie with the Crown-in-Parliament or a massive constitutional crisis will occur. This is the real meaning of the West Lothian question. All further devolutionary measures can only be at the discretion of Westminster, yet the demands for them to become popular rights based in a form of popular sovereignty has now become unstoppable. The Crown is not a harmless anachronism as the Queen’s interventions show, but a dangerous force for reactionary pressures as well as constant centralisation of political powers in a narrow Westminster elite. Popular sovereignty implies a republican form of government. Republican consciousness and pressures are only growing. Yet there is no mainstream political pressure to transfer from the Crown-in-Parliament to popular sovereignty in a written constitution. David Cameron hopes to stimulate English resentments about any future changes, “millions of voices of England must also be heard. The question of English votes for English laws … requires a decisive answer.” The English also lose under the parliamentary sovereignty regime that exists. At present, Cameron fixates on removing Scottish MPs’ abilities to vote on clearly English matters, creating two tiers of MPs. He cannot explain what would happen in Cabinet if Scottish members should be able to speak on English matters, without creating a massive erosion of Cabinet collective responsibility. None of the planned “constitutional” arrangements can work. Like a partially inflated balloon, pressure on one spot increases distortions elsewhere. He pretends that there can be devolution of some powers to the cities; the same ones that have been removed for over a century. This cannot stop tensions between wealthy and poorer cities from arising. But Westminster fears regional assemblies. These would challenge its monopoly of sovereignty with a powerful electoral mandate outside. Indeed if Scotland decided to become independent, England would probably disintegrate. The Daily Record’s Vow has already collapsed as the different parties in the troika cannot agree over how to bring into existence its unworkable policies. According to Gordon Brown, “the Tories have still to support half of the powers that Labour proposes.” Even if agreement can be reached, the constitutional anomalies will only cause further problems. A sense of betrayal is already building up as more and more voters realise they have been deceived. This is why another Independence Referendum is inevitable. A new settled will is being created. If the result of Westminster’s elections create instability then it may be possible to launch a demand for one. However, the main battles over the next period will not be for mobilisation. It will be for the battle of ideas. Thomas Paine pointed out that it was absurd to talk or write about the British Constitution because the UK didn’t have one. It is that absence as well as the legitimacy of the methods used to fill that absence that will be discussed. Most importantly, though, it will be the policies that should be in a future constitution that will be of concern. This will include a better understanding of the importance of a republican perspective to all political issues. A Constitutional Convention to draft the future written constitution should still be called. It will require months of in-depth community discussions. It can create the structure of the future Scotland that came out of the many discussions that took place during the Independence Referendum. Undoubtedly, not all proposals should be included in a constitution, but numerous creative ideas arose. It has become clear that a written constitution should make it impossible for national assets to be sold at the whim of government; that financial assets should be kept in public hands to avoid future calamities; along with energy resources so they can be made more environmentally friendly and avoid fuel poverty. A clearer definition of individual rights and responsibilities on employment, housing, gender equality and civil rights needs to be defined. At present, Scottish history makes organisational unification unlikely. However, obtaining a consensus around an agreed constitutional form may provide the perspectives to bring about necessary unity for progress to occur. This approach can bring many into this process. There is no reason why the Scottish Government cannot still pursue this goal. Indeed it could easily be seen as a logical continuation of the referendum process. Already a number of independent bodies have been brought into existence by this process Women for Independence, Radical Independence Campaign etc. who would participate in this process. For the present, the SNP will lead the organisational movements for national independence. After all, it is more than its organisation; it has the control of government. This may be unpalatable to many, but the left can only find openings to challenge capitalism’s priorities and goals through other movements for the time being. However, it must build more clearly its ideas of self-determination and bring them into a popular base. At all times, it will be essential to promote a class independent perspective, especially in elections. Unlike the nationalists or independistas, our goal must be self-determination for the working class and its allies through national self-determination. The final weeks of the referendum campaign showed how quickly events can move after lying dormant for a long time. It was time when decades of hope and anger were expressed in a few weeks. It will occur again soon. But this time it is necessary to have the right ideas creating and leading the organisations that will make the new future Scotland. RIC – A SCOTTISH REPUBLICAN MOVEMENT IN THE MAKING? Yet we still won 45% of the vote, and badly rattled the British ruling class in the last two weeks before September 18th. Cameron had only conceded the referendum, and signed the Edinburgh Agreement, back in 2012, because he thought the prospect of any alternative to the ‘Westminster way’ would be trounced – “There is no alternative”. We showed that, “Another Scotland is possible”. Furthermore, since September 18th the mood of anger and defiance has continued. From September 19th, the day after the referendum, and despite all the illusions and contradictions involved, tens of thousands joined the SNP, with several more thousands signing up to the Greens and SSP. RIC branches have had the largest attendances they have ever seen. Today’s RIC’s national conference in Glasgow will be the biggest yet. RIC has the potential to reconstitute itself into a republican movement that unites struggles in the economic, social, cultural and political/democratic arenas, and provides an inspiration beyond Scotland. 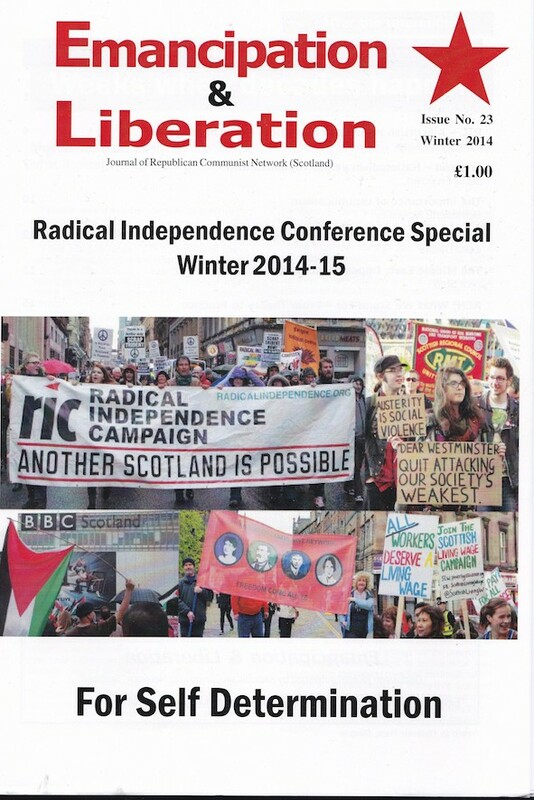 RIC’s specific Scottish contribution to the Global Movement for Social Justice would lie in its recognition of the need to break-up the UK state and its alliance with US imperialism. This potential is already latent in the updated RIC principles agreed at the September 27th National Forum; in our reaching out to working class communities that have been abandoned by mainstream politicians; and our linking up with socialist republicans in England, Wales, Ireland and Catalunya. Being republican does not mean merely having an aspiration for a future monarchy-free Scotland. It means making the democratic affirmation, in the here and now, that sovereignty lies with the people, and not with Westminster. In contrast, the SNP leadership believes its authority lies in the mandate it achieved by getting elected to Westminster’s devolved Holyrood parliament in 2011. This is why, in the event of a ‘Yes’ majority on September 18th, the SNP government would not have acted as if this vote had transferred sovereignty to the Scottish people. Instead, they intended to bring Holyrood’s unionist parties into their negotiating team with Westminster. The making of any future constitution would have been left to the ‘great and the good’. Profoundly anti-democratic features would have been hardwired, such as acceptance of the monarchy, and hence the long reach of the UK state’s Crown Powers. The ‘Yes’ vote would only have been used as a bargaining counter in negotiations with the Westminster unionist parties, not as the basis for beginning a process of popular consultation leading to a constituent assembly, where Scotland’s constitution could be determined. The underlying democratic principle, which brought the SNP government and a much wider array of democratic forces together, including RIC, was the exercise of Scottish self-determination. However, the SNP government’s own ‘Independence-Lite’ proposals accepted the continued role of the Crown, the Bank of England, the British High Command and NATO. This highlighted the class nature of the SNP government’s own decidedly limited version of self-determination. They act in the interests of a wannabe Scottish ruling class, which seeks no more than a junior managerial buy-out of the local branch of UK Ltd, and is ready to make its own deals with Global Megacorp. In the event of a ‘Yes’ vote on September 18th, RIC would have become involved in a major struggle with the incumbent SNP government and their new Holyrood unionist allies. At our May 17th National Forum, we had already agreed to reach out to all those autonomous local ‘Yes’ groups, inspired by the process of active political participation they had just been involved in. The aim would have been to counter the SNP government’s return to an acceptance of self-determination limited by Westminster sovereignty. Instead we would have championed Scottish self-determination based on the sovereignty of the people. The building of a popular constitutional movement is the only way this democratic principle can be exercised in practice. What now in the aftermath of the ‘No’ vote? The dramatic change in our political fortunes could be seen within days of the ‘No’ majority. The unionist parties’ combination of threats and “vows” gave way to a new reality. The overwhelming majority of unionist MPs, Conservative, Lib-Dem and Labour gave their assent to the third Iraqi war. In order to cut taxes further for the rich, the Conservative Party conference promised an even greater attack upon welfare recipients, including their new majority – the low paid. There was also the attempted drive to remove many of the newly signed-up from the electoral register, using the fear of debt collection as a threat. UKIP, taking full advantage of the mainstream parties’ resort to attacks on migrant workers and benefit claimants, were given an extra boost by the pro-imperial, pro-war, pro-monarchist Union Jack flag waving that accompanied the official ‘No’ campaign. They won their first elected MP. UKIP will be a constant pressure on both the Conservatives and Labour. Cameron’s “English votes for English laws” followed directly on Farage’s September 19th letter to Scottish MPs. Jack Straw’s call to have Westminster make the UK “indissoluble” is an indication of UKIP’s pressure on Labour too – even if his proposal is more Franco than Farage. For now, the political initiative, over the future of Scotland, has passed to the Westminster government. Their overriding concern will be to ensure that the unforeseen democratic pressures exerted by the mass popular campaign are demobilised and diverted into the official channels. Lord Smith has been summoned for this purpose. His lordship is very much part of UK state’s Crown-in-Parliament set-up – his title is a bit of a giveaway! Although anyone can make a written submission to Lord Smith’s commission, the only real players are the Con/Lib-Dem Westminster government along with Labour and the SNP Holyrood government. Despite their own heavily trailed, pre-September 18th federal/‘Devo-Max’ “vows”, the Conservatives and Labour can be expected to unite against these, now they are being advocated by the SNP government. Where they hope to find common ground is over devolved income tax-raising powers, so that Holyrood takes increased responsibilty for implementing austerity. John Swinney and other SNP Right wingers such as Michael Russell, who openly advocate neo-liberalism, would very likely go along with this. However, it is quite clear that any demands for meaningful change from Westminster will only bring about small-scale concessions, which do not address genuine popular concerns. Lord Smith, Westminster and the unionist parties have already been successful in ensuring that the SNP government sees its new role in “holding their feet to the fire”. So, everything is now to be directed towards the 2015 Westminster elections. The aim is to maximise the number of SNP MPs (whilst possibly allowing for a few selected cosmetic non-SNP ‘Yes’ candidates), to hold the balance of power in the event of another hung parliament. Beyond this things get murky. What would an SNP government trade-off in return for some already watered down political concessions? The 2007 SNP Holyrood government was quite prepared to go along with Conservative budget proposals to obtain their support for the formation of a minority government. Catalan Convergence, which forms the Spanish state’s devolved Barcelona Generalitat government, resembles the SNP in its desire to be the mouthpiece for domestic business interests. It has been quite prepared to prop up Right wing Spanish neo-liberal, pro-war governments in return for minor constitutional concessions. To get the room to manouevre and make their own deals with Westminster, the SNP leadership wants complete hegemony over the movement for Scottish self-determination. They want support for their MPs, MSPs, MEPs and local councillors, whether imposing further austerity, more privatisations, or supporting further wars. When Bernadette McAliskey addressed last year’s RIC Conference, she warned of the demand made by the new post-1918 Irish government, “labour must wait”. As she pointed out, nearly a century later, the Irish working class is still waiting! The SNP government knows, however many MPs they gain in 2015, they will not be granted another referendum by the UK state. However, they still hold illusions that this could be possible later. The September 18th result was far narrower than the mainstream unionist parties initially thought possible. They have learned their lesson, and will not make such a concession again. Furthermore, the whole unionist camp is moving further Right, with UKIP now dictating much of their direction. The SNP have no answer to this. Some, on their ‘Independista’ wing, may conjure up future scenarios, such as winning a Scottish majority of SNP Westminster MPs, or of Holyrood MSPs, to provide an alternative mandate for independence. However, it is very unlikely that the very constitutionalist SNP leadership, keen to keep its big business backers on board, would adopt this course. Furthermore, from a democratic point of view, the only democratic mandate for the exercise of genuine Scottish self-determination lies in winning majority support. However, for this to be achieved in defiance of Westminster, there would need to be a break with the UK’s Crown-in-parliament sovereignty. There would need to be a recognition of popular sovereignty, which can be exercised either by a Holyrood government elected with such a mandate, or by a Citizens’ Initiative referendum. Ambitious though it may appear, RIC should start building support for a social, secular and democratic Scottish republic on the basis of popular sovereignty, with the aim of taking the leadership of the movement for Scottish self-determination from the current SNP government. This means having a long term strategy, and not just making knee-jerk responses to every call to action or top-down initiative presented to us. Many of the new members who have joined the SNP are indeed to the left of the leadership. But it will take some time before they realize that the SNP can not be converted into an instrument to meet their needs. Just as Tony Blair’s success in getting the 1993 conference to ditch ‘Clause 4’, brought about ‘New Labour’; so Alex Salmond’s success in getting the 2012 conference to ditch opposition to NATO, heralded the ‘New SNP’. It is now also a party run by the ‘suits’. The SNP’s constitution prevents the formation of distinct platforms, and has the power to suspend branches. What the SNP leadership wants from all their new members is electoral campaigners on the ground and more money. What they don’t want is a radical alternative to the party’s current neo-liberal and pro-imperial course. John Wilson, MSP, who belatedly resigned from the SNP, after the referendum, over its pro-NATO stance, obviously understands the limitations in challenging the party leadership from within. One of the biggest obstacles we faced in campaigning for a ’Yes’ vote was the ability the UK state to use its unionist set-up to promote divide-and-rule against any meaningful self-determination. The Irish have long appreciated this, which is why republicanism, or the recognition of sovereignty of the people, has greater roots there than elsewhere in the UK. The ‘Better Together’ campaign was also able to build on the pre-existing British institutional and mainstream unionist party support for the UK. They were able to organise larger rallies outside Scotland. And certainly, the engrained Left unionism of much of the British Left held back a bigger Left response in England. However, we must look beyond the false choice being offered by both the mainstream unionist parties and the SNP government. They realise that there is a growing reactionary unionist challenge to the current New Unionist’ ‘Devolution-all-round’ settlement. This is currently being organised by UKIP, but also with Ulster unionist, loyalist and British fascist support. However, the alternative mainstream unionist, minor liberal constitutional reforms, coming from Lord Smith, will not hold back the growth of reaction. This draws its support on all the most reactionary features of the UK constitution, which the mainstream unionist parties do not challenge. No matter how reluctantly, the SNP government is likely to accept the outcome of the Smith Commission, because it accepts the principle of Westminster sovereignty. Even in the event of a ‘Yes’ vote, they wanted to enter into a new relationship with a continuing rUK. RIC however, has sought support in in England, Wales and Ireland for the break-up of the UK state. This state acts against the interests of the exploited and oppressed throughout these islands. People like Tariq Ali, Billy Bragg, Paul Mason, George Monbiot and Will Self, have also begun to appreciate that the peoples of these islands can enter into new relationships that do not depend on the existence of the UK state. We are lucky to be living at a time of a growing popular clamour for democracy. As an alternative to the mainstream unionists and the SNP government, RIC should become the movement which campaigns for a social, secular and democratic Scottish republic. Here, the national democratic principle of self-determination is linked to the international democratic principles of solidarity and unity from below. After our first conference in 2012, the ‘C’ in RIC’s initials changed from ‘Conference’ to ‘Campaign’. Perhaps it is time to think of RIC’s initials as the Republican Internationalist Coalition in Scotland. Allan gave an edited version of this as a talk to the eirigi ard fheis in Newry on November 29th. Thank you for sending me a copy of E & L. It is full of good stuff, specially relevant to the occasion it was targeted at, the RIC Conference. As I read through your own article, I began mentally highlighting the quotable bits, only to discover that they were legion, in every paragraph! I only began to cavil as the article drew to a close – from the paragraph beginning “At present, Scottish history makes organisational unification unlikely” on – but my wish was for more detail, not for anything different. articles complement one another very well. speaks of a “constructive opposition”. What form might this take? What mileage is there in a “Yes Alliance”, or a “Scottish Left Project”? Is there any sense in trying to form a new political party, to channel the energies and achieve the education and organisation of the thousands of newly radicalised folk? By what means, parliamentary and extra-parliamentary, can independence be achieved, whether by another referendum, by UDI, or by a Luxemburgian general strike? does the Labour Party deserve to have inflicted on it? So much to be decided! so, being an old-fashioned print-man and bibliophile, I was very pleased to find it in good black print on paper. Thanks, comrade, for spreading these laboured-over lines to a better readership than they would otherwise have got.